A couple of weeks ago we wrote about the excellent TAP Air Portugal one-way (and return) fares to the United States from Dublin. There were as low as £600 one-way in Business Class. You can fly to New York, Boston or Miami. The only snag is that you need to fly after 31st March 2019. TAP has now extended this offer to London departures, via Lisbon. For example, Heathrow to Boston on 15th May is £729 one-way in Business Class. You can also fly from Gatwick and London City. For £860 you can buy a fully refundable one-way ticket which could be a back-up if you are waiting for Avios seats to open. Note that the deal does NOT work in the other direction, flying from the US to London. Return fares are also available for around £1300. It is definitely a good deal for anyone unsure when they will be coming back, although you MUST book a random cancellable Avios return ticket home to avoid any problems with US immigration. This is also worth a look if you have the ‘£200 cashback for £600 spend at Amex Travel’ offer showing on one of your American Express cards at the moment. A free stopover of up to five days is possible in Lisbon. If you book on the TAP website this is offered to you during booking. TAP Air Portugal is a member of Star Alliance so your flights will earn miles in any Star Alliance frequent flyer scheme. Hat-tip to Flyertalk. 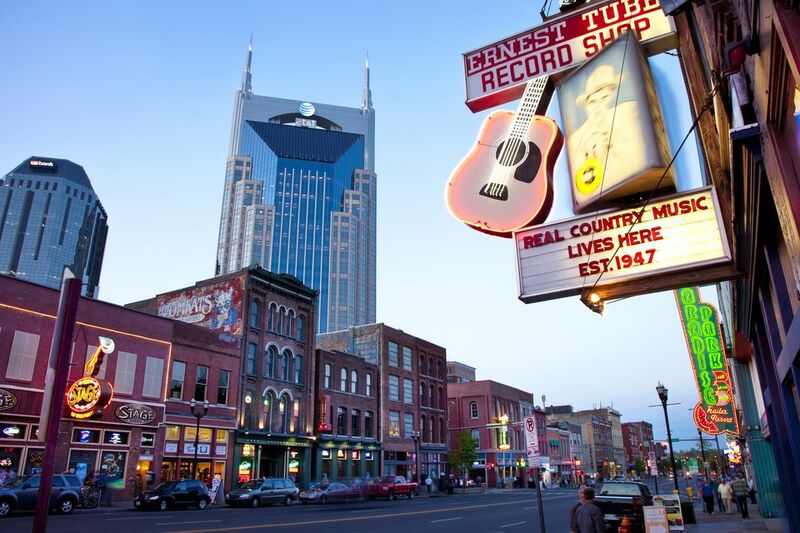 British Airways has announced that the new Nashville service, launched in May, will be moving to daily operation from the Summer 2019 timetable. There are presently five flights per week, but this will increase with the addition of a Thursday and Sunday flight. All flights will use a 3-class (no First) Boeing 787-8. The first additional flight will be on 31st March. Seats are now bookable – if you tried and failed to get Avios seats for next summer, it is worth looking again as there will be seats available on these new services. 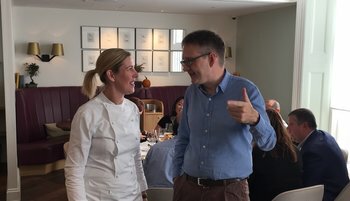 A quick ‘hi’ to the HFP readers I met at the ‘Core by Clare Smyth’ Marriott Rewards lunch. This was the definition of a ‘money can’t buy’ event – except you could buy it from 30,000 Marriott Rewards points, which is the sign up bonus on the SPG American Express card. ‘Core by Clare Smyth’ already had a huge waiting list to get a table, but demand went through the roof when the restaurant was awarded two Michelin stars last week, just 14 months after opening. Being able to buy seats (for points) at a private lunch, exclusively for Marriott Rewards / Starwood Preferred Guest members, was a privilege. Here is a photo of me chatting with Clare. Don’t ask why I’m pointing – we’d all had quite a bit to drink by this point …..
Those who had stumped up 75,000 points for the cookery masterclass seemed to have had an excellent morning, kicking off with breakfast and then working with Clare and her team to prepare parts of the meal. There is, as I like to stress on HFP, a lot you can do with your points outside of more flights and more hotel rooms. Hilton, Marriott / SPG and Emirates all offer excellent ‘experiences’ packages for points, and we feature the best of them on HFP as they come up. Core…..very nice, available via Centurion concierge. Interesting to watch new areas emerge as worthy venues, as residential prices expand peripherally. That’s the fun of watching London and dipping in, then relaxing back out on a bi-weekly or less regular basis! I’d be smug if I got one! Not sure Kensington Park Road in Notting Hill counts as up and coming! To be fair Rob if one is a pensioner like the OP, you may remember when Ladbroke Grove was not quite what it is today…. Up and coming for 25 years? For our anniversary last month we had dinner at the 2* restaurant at the Intercontinental Bordeaux. It cost about €400 which makes 30,000 Marriott points each seem like an absolute bargain! I had a look at the deal but couldn’t make it. I’m sure it was 30k for two. Can you use this offer via Amex Travel, bag the £200 back and fully cancel the ticket and receive the refund in your bank account? Very greedy. It’s this kind of gaming the system which ends up ruining it for everyone else. of course Amex may still claw back £200 if the refund is sent back via Amex. ABC1s you say? That’s sounding increasingly ridiculous.. If you’re looking for a standard business class return don’t forget the 6 month rule. Direct BA fares to Boston are only £1385 from April next year. Google Flights is a great tool to see prices for every day every airline. Noticed that last night when I was doing some pricing on google. Was surprised when it was BA and VS that came up with that price as it’s usually icelandair at that price point. I loved Clare’s food at Royal Hospital Road – it vastly improved once she took over from Gordon, but I just couldn’t find anything to love about Core. Can’t say I was too surprised to see it win 2 stars though, as the majority of other London Michelin star restaurants are not worthy either. Awards for food have always seemed a bit off to me given its a personal thing. I’ve had better meals for $1 from backstreet stands in random Asian towns than from supposedly well reviewed restaurants. I don’t disagree. I was very impressed by it but that doesn’t mean I have to love it. Michelin scoring is inevitably highly subjective (I was not at all impressed by the stuffy service and lukewarm food at Le Bernadin in NY which is in many people’s top 20 on earth lists); but restaurants in more out-of-the-way geographic locations (i.e. anywhere outside London in the UK context) do seem to be more consistent – I suppose they have to try harder to get noticed – and with less money floating around than London have to offer consistent quality to survive. Flew CPH-LIS-MIA with them in Feb this year £380 one way business which was widely available last year and a real bargain. CPH-LIS was bang average euro business class on an A320. Lounge in Lisbon I thought was up there with the best. Good selection of food, great gin and tonics painstakingly made by the bar staff, nice views of the runway. LIS-MIA was on an old A340 with recliners – service good, food OK. Very annoying as our plane was swapped from a newly refurbed plane a couple of days before. I think they are in the process of completing a full refurb, so will hopefully all be done by next year. O/T but hotel points for experiences related. Just wanted to say thanks again to Rob/Anika for another amazing experience I couldn’t have got without HFP. I went for the McLaren factory tour yesterday, it was simply amazing. Thoroughly enjoy it all. I would highly recommend for any McLaren fan. Nice to meet a couple of other HFP readers there. Also to add that Michael McIntyre was fab last week – very enjoyable evening in the SPG suite. Nick sent me some photos actually! OT: The best row (30) in Cathay PE is highlighted as a priority row from which they may bump you to another row if a disabled passenger needs to sit there. I will be travelling with my partner and our 2 year old. Does anyone have experience of whether they would bump one of us, splitting us apart and leaving one of us with the child? O/T Amazon £5 on Amex £20 spend – actually I only got 2 success emails but just checked and all 3 £5 credits have hit the a/cs. If buying goods as opposed to giftcards or topups the emails will probably not come out until order is shipped and charged. OT – Generally, which long haul destinations have the best avios availability for F? I will trigger my 241 in a few months and have about ~ 250,000 avios. I have never travelled F on any airline and I’d love to be able to take my partner somewhere and experience it. Is it likely I will find two redemption seats somewhere desirable e.g. USA West Coast? Good suggestions. Both Vancouver and Seattle are well worth visiting and the surrounding areas as well. An open jaw with both could be a good option. West coast USA is a good option as you get to experience a daytime flight on the way out and night time on the way back. LA availability is very hard to secure. I’d recommend you open jaw it i.e. fly to one destination and fly out of another. You should be able to make something work if you consider San Jose, San Diego, Las Vegas as well as the well known LA and SF routes. Good luck and you’ll have wonderful first time in First! San Diego might have better availability – if you want to max out the First experience possibly better to fly out TO SAN as the lounge isn’t anything special – it’s absolutely fine, just the the general lounge for Priority Pass etc. A good point re the San Diego lounge. American has used it since they closed their own lounge, and people can pay for access, but I don’t think you can actually get in with Priority Pass. It can get fairly crowded before the BA flight. The American Airlines staff at the entry “desk” are delightful, and very helpful, but it isn’t really a first class lounge. Is there a way of searching multiple destinations at once? The thing I find cumbersome about these search facilities is that you have to search one destination at a time whereas it would be good just to be able to look for general F availability, or all destinations with F or CW on a specific date. Does it have to be proper long haul ? New York and Boston pretty much always have availability in F in my experience, I’m booked on my second F trip to Boston, a lovely city if you’ve never been. Time it right and you could be on the A380 too. It might be a good idea to check aircraft types for the routes you are interested in and find out how the First class experience compares on the different aircraft types. Some people have mentioned A380 routes on some routes, whereas San Diego, for instance, is usually a 747. While I haven’t been affected directly, the two people I referred for the SPG card are having a nightmare of a time trying to get their points posted. Everything from August just goes to a void and I know they’re not the only ones… I’ve told them to open complaints with both Amex and Marriott but does anyone know where the fault actually lies? If it was me, I’d be asking for loads of points from both parties. Isn’t it essentially false advertising? I also filed a complaint and missed calls from Amex twice about the complaint. Surprisingly received £50 a few days ago. Now looks like it’s the compensation..
amex told me that due ‘data protection’ cited by marriott, marriott are not sharing the data reqd for points transfers. Damn. I could check in OK for tomorrow but my son got the dreaded ‘Cannot check in online’ notice, I guess he has been random picked for the ‘careful check’. My OH got that in August, but he was only barred from ONCI at LHR. So they obviously weren’t bothered about him being up to anything nefarious on the connecting flight! From 5am in Club Europe (at Heathrow or Gatwick) …. I wonder what the lower age limit is on getting these special security checks – my son’s only 17! – sounds like a SSSS but we’re not going to the States, is it getting common on flights to Europe as well? No. It’s not a security issue, it’s a sync issue between different parts of the booking/ticket. One hint that works some of the time is to remove your APIS and start again, that often does the trick. But then – how can he check in online? Had to change his passport number with 1 digit change (to wrong number), check in, change back passport to correct number. Bad news is: all Exit seats have gone, so no freebie tomorrow. But worry lifted, what a strange system. All good – they let us check in T-nearly 4 hrs, no problem. Here’s a one – whilst there were no exit seats available (all gone, but I could have had them for free if they were available) – my check in agent said there were another 22 seats available to switch to but that I couldn’t because of my lowly status/ RFS redemption basis (not that she said it so bluntly). Theoretical seating at work. Got 2 good seats anyway so no problem – and I guess a few are CW. Not sure if self check in @ machines in LHR would have freed up all the ET seats, quite possibly. Anyway, sitting in No1 T3 (no £5 reservation), if anybody wants to say hello. Pretty full.